With the continued adoption of advanced CSS by browsers, we are starting to have the ability to do more and more using just CSS. 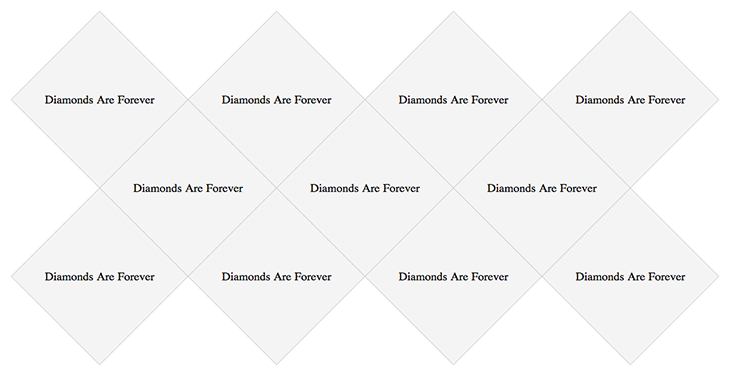 As we have seen, you can make all kinds of crazy shapes with only CSS. 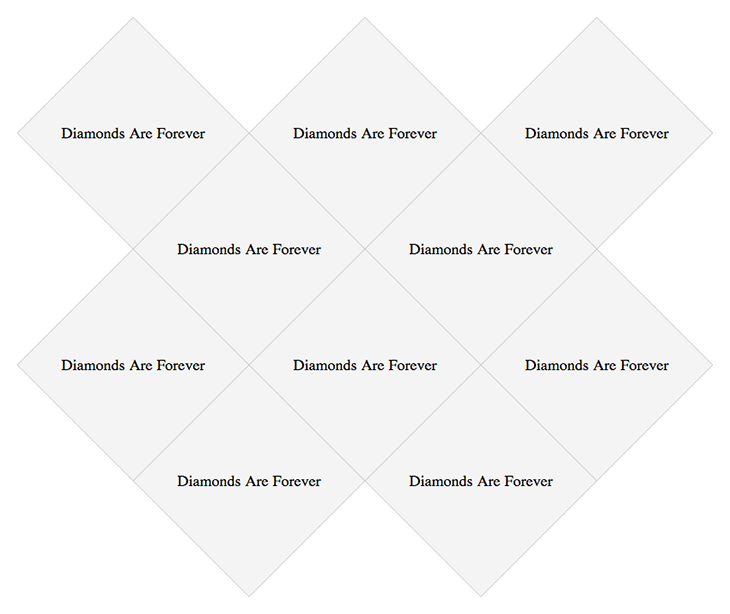 On a recent client project, the designer challenged me with a grid of diamonds. Oh, also, this is a responsive site. Challenge accepted! So first, I focused on just getting a single square rotated and working how I wanted. Then, I moved to a single row. Then, multiple rows. Finally, multiple rows at different breakpoints. I’m using Modernizr to detect if the browser supports CSS3 Transforms. I’m using Sass and Compass for all of the CSS. I’m including all of the Compass CSS3 mixins: @import "compass/css3". Honestly, the padding value on the list and the right margin on each list item were a result of me just doing some pixel nudging until things aligned correctly. Again, lots of pixel pushing to get things just right. I would expect if you wanted to use a layout like this, you will need to do a bunch of pixel nudging and adjustments to suit your needs. But, this is just an example of what can be done. But, then the text gets all blurry, so that kinda stinks, but I guess it is the lesser of 2 evils. Below is an image showing the grid without the fix and then with the fix. Here is the GitHub repo and a demo. Go forth and make some creative layout with different shapes!